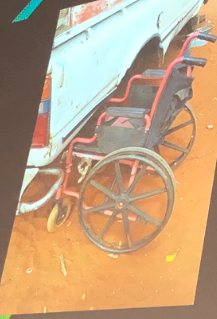 In his keynote address to the National NDIS and Mental Health conference, Scott Avery shows a slide of a wheelchair discarded in Alice Springs. In the city, a wheelchair may be a perfect person-centred response to disability, says Avery, an Aboriginal (Woromi) man who is the Research and Policy Director at the First Peoples Disability Network Australia. It’s light and easy to pack away in a car and navigate on footpaths. But it proved unsuitable in a remote outback environment with no footpaths “and where the heat can sometimes melt away the tyres”, he said. Avery gave another example of how disability support has to take into account the “hostile environment” in which many Aboriginal and Torres Strait Islander people with disability live, this time for someone seeking mental health support. In the course of a recent research project that brought together the statistics and stories of Aboriginal and Torres Strait Islander people with disability, Avery spoke to a man who regularly attended sessions with his psychiatrist in his regional community but then had to endure regular racial taunts from people driving by when he walked home. 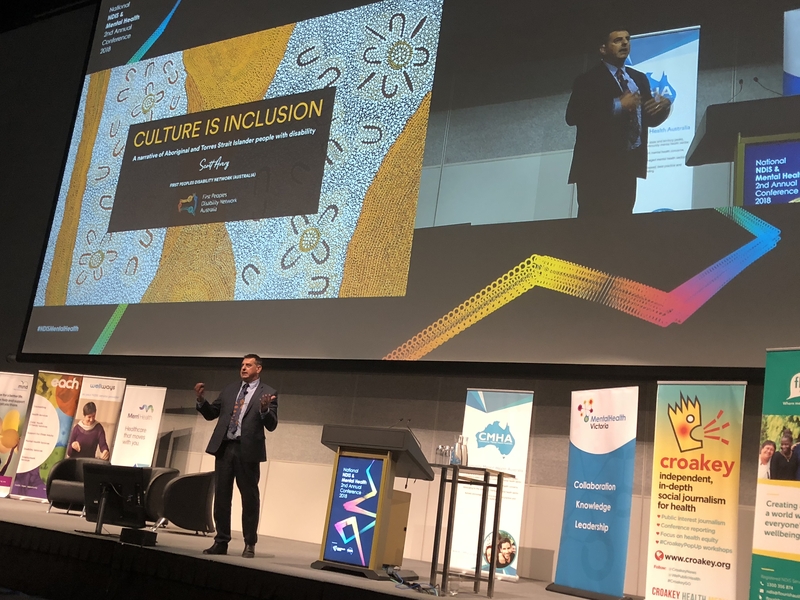 It’s an important warning for health professionals, services and the NDIS to be acutely alert to the experience and impact of trauma, discrimination, able-ism and racism, Avery told the conference. 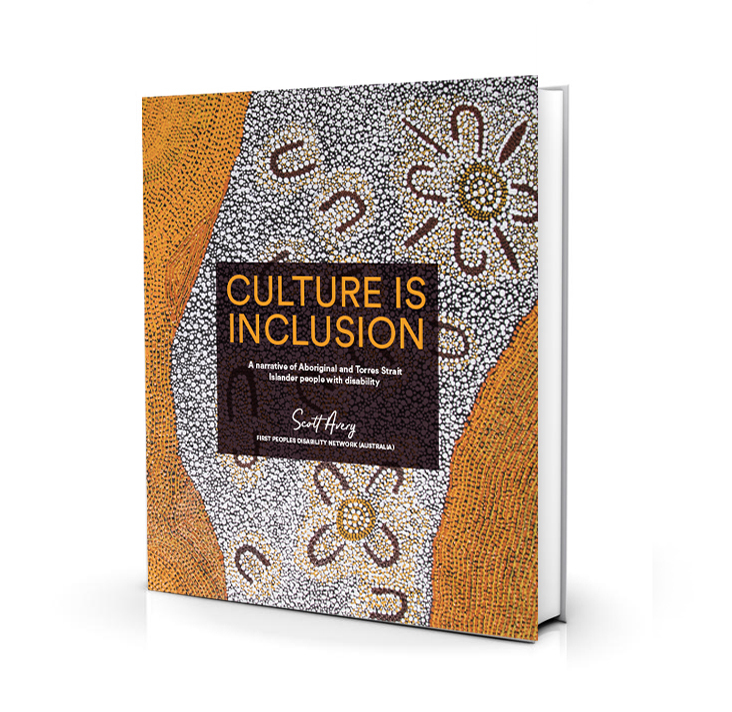 Avery recently published Culture is inclusion: a narrative of Aboriginal and Torres Strait Islander people with disability, a report (available for order) that combines statistical data with the personal testimonies of 47 Aboriginal and Torres Strait Islander people with disability. “Tell us your story – that was our research question,” he said. As he also wrote recently at The Conversation, the work has shown that the NDIS “isn’t accommodating the unique needs of Aboriginal and Torres Strait Islander people with disability”, and particularly around the intersection of physical, mental and social needs. That was underlined soon after the report was released with the news that the National Disability Insurance Agency (which administers the NDIS) asked for an Aboriginal child with cerebral palsy to be placed into care because it would no longer pay his accommodation costs in Tennant Creek, he said. There is also the big issue of “thin markets” in remote areas, where there are no or so few services that people can’t exercise the choice and control promised by the NDIS. Avery found that, in one Aboriginal community, NDIS support packages – in some cases at around $50,000 per person per year – were not translating into actual expenditure as there weren’t any disability services in the community that participants could purchase. His concerns were echoed at the conference by the NT Mental Health Coalition and Queensland Alliance for Mental Health, which said that although there is “remote weighting” in the NDIS pricing structure, it doesn’t take into account “the tyranny of distance, a thin market and the challenges of good governance and competition in rural and remote regions. Avery’s research shows that Aboriginal and Torres Strait Islander people with disability experience a unique form of ‘intersectional discrimination’ and social inequality – “a double disadvantage”. Indigenous people who live with disability experience far greater inequality when it comes to social, health and well-being, compared to other population groups, including Indigenous people without disability, and people with disability who are not Indigenous, he said. 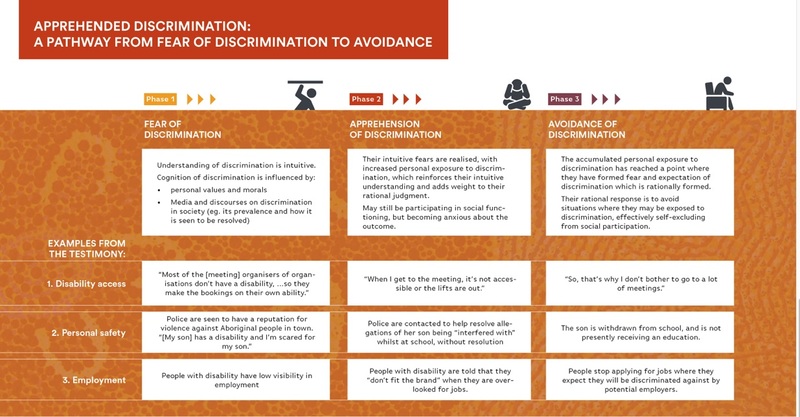 That “intersectional inequality” in turn has a detrimental impact upon the social health and wellbeing of Aboriginal and Torres Strait Islander people with disability. The sole exception is in the social participation that Aboriginal and Torres Strait Islander people with disability have within their own communities, where participation rates in cultural and community activities are on par with other Aboriginal and Torres Strait Islander people. “A culture of inclusion is a moderating force on the social health and wellbeing and has a mitigating impact on intersectional inequality,” the report says. Avery told the conference this was because Indigenous cultures are “innately inclusive”. He talked about his own experience, as a “profoundly deaf” person. Members of his community might call his deafness “dead ear” in Language, but it’s not pejorative – more to communicate “you might just have to throw things if you want my attention,” he laughed. Where the trouble begins is with the NDIS and Western culture: “(they’re) actually telling us to disable ourselves,” he said. 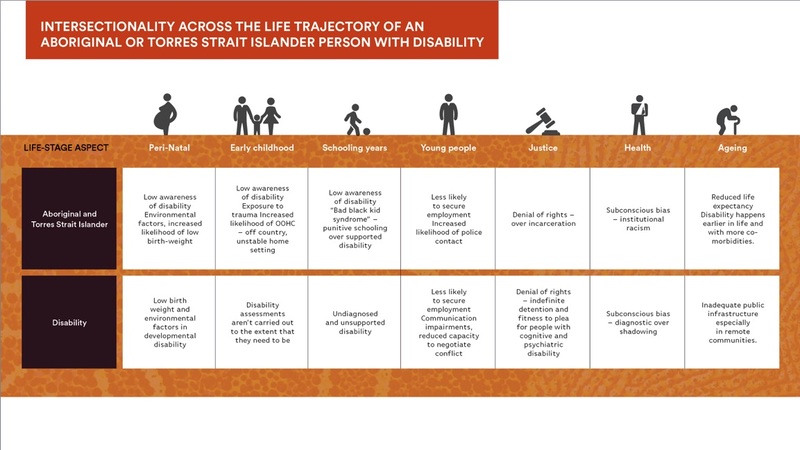 Showing a slide outlining the life trajectory of an Aboriginal or Torres Strait Islander person with disability, he challenged people at the conference to think about their own pathway, the support and encouragement involved in getting them to where they are today. That sounds depressing, he said, but it underscores that the trajectory is not inherent in the person, “it’s the forces that position them into vulnerability, (which) actually means we can do something about it, we can actually alter this life trajectory if we are serious about altering the pivot points away from imprisonment and into a life of fulfillment”. “What is disabling for our mob – it’s not the broken eyes, the broken ears, or the broken limbs, it’s the broken spirit,” he said. Slide by Scott Avery. Published with permission. Meanwhile, NT Mental Health Coalition Executive Officer Vanessa Harris says the NDIS could look to the work of the Miwatj Health Aboriginal Corporation, which is wrapping the NDIS into its existing comprehensive primary care model. She said many Aboriginal people in the Northern Territory struggle to prove their eligibility for the NDIS, if they are even aware that it is available to them. She said the Federal Government talks about GPs as the “front door” to the NDIS, but that many are overwhelmed by the NDIS (a concern shared in another conference session by Australian Medical Association president Dr Tony Bartone), or inaccessible. For example, in places like Katherine, not one GP bulk bills, which means many people who may be eligible for the NDIS can’t afford to go to a doctor or don’t have a “long paper trail of unwellness” to prove their eligibility. She outlined the Miwatj model, where a mental health team is made up of Elders, with independent psychiatrists brought in to provide training and support. “We don’t want FIFO (fly in fly out) workers,” she said. Read more about the issues facing remote areas of the NT and Queensland in this joint submission to the ongoing Senate inquiry into the provision of mental health care in rural and regional areas. The conference also heard about the Peer Work Project run from Alice Springs by the Mental Health Association of Central Australia (MHACA), supported through an NT Department of Business NDIS Innovation Grant. MHACA CEO Merrilee Cox said the severe disadvantage experienced by many Aboriginal people living in remote areas meant they may struggle to articulate their needs “within the context of the NDIS”, where often what they see as their needs or goals are “a blanket, somewhere to sleep or the desire to go back to country”. There was, she said, significant evidence that peer workers could assist Aboriginal people to prepare for the NDIS planning process, but many organisations had retrenched their peer workers since the NDIS began to roll out, and the NDIS pricing structure worked against trying to rebuild that workforce. The MHACA project aimed to build that capacity but issues that emerged along the way highlighted many of the barriers in remote areas, including where two mainstream partner organisations have been unable to participate so far due to staff turnover and that there is nowhere in the NT to do peer work training so some funds had to be used to buy it in. Cox called for a broader focus from the NDIS on peer support, saying the peer workers in the trial have broadened what MHACA can offer “and brought a sense of warmth and inclusiveness to the services”. • Bookmark this link to track Croakey’s coverage from the conference. • Declaration: Marie McInerney has provided communications consultancy to Mental Health Victoria this year.